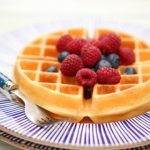 Fill waffle maker with batter and follow waffle maker instructions. For a Belgium waffle maker I use 2/3 cup of batter, for a smaller waffle maker, I use 1/3 cup. I used a Belgium waffle maker and used the minimum setting. I poured in the batter, flipped the waffle upside down and let it heat for 2 minutes. Flipped it right side up, opened the lid and removed the waffle gently with a rubber spatula. Serve with berries and maple syrup. Waffles can be reheated in a 350 degree oven for 6 minutes.